- - - a loss end in your life! If all you can find to mock me for is my native English language then your really at a loss end in your life! I'm not at a loose end so I've only skimmed through this thread but it's clear that your use of the English language is not the major cause of mockery. This whole sorry saga reminds me of the story of Ryan Dunlop and Hitz Radio in Scotland back in 2006-7. A young man claimed to be running an internet radio station from his garden shed getting stupid amounts of listeners globally. He managed to get national press attention and caught the interest of the radio industry. That was of course until the authorities got involved!!!! I worked in the industry at the time, and to see that kind of nonsense written by journalists in the national press, and broadcast on BBC Radio 5 Live along with regional television was an embarrassment. It veered into fraud raising money through schemes available in Scotland at the time, and not paying royalties for music used. I can see that it is very different from selling airline tickets, but the comparison I am making is that of a young person, whilst delusional, is way out of their depth. Ah, yes - obvious parallels! Thanks for the clarification. I do wonder though whether our airline hero has any intention of starting an airline.... is this just some sort of pure scam? Its a scam. The sad thing is, the bloke behind it doesn't realise that its a scam. He thinks he's doing well. Hence the delusional aspect in all this. Sadly for him, the more he goes on social media, and now here, the more notice someone in a position of authority is going to take. 1. He genuinely wants to start an airline and believes he can, but he can't and won't. People who invest will lose their money. 2. He wants to start an airline as a way of making money, he expects to raise so much he can skim and start an airline. 3. This is just a pure fraud; he has no intention of starting an airline but that provides a useful cover. I can't suss out whether it is 1 or 3. On so the social media continue. Why post a B737 paint drawing from ages ago that has (c) flying colours watermark on social media? Or is it an Essex library picture where another paint drawing is seen on the computer screen. If you enlarge the (c) flying colours picture, look closely at the font and colour of dates, both these are different and not aligned. Also the contact has no followers in social media so always suspect, unless proven otherwise that is Jason? Twin Aisle - I think it's number 1. It does seem as if the airline industry attracts more than its fair share of delusional wannabes (it's a strangely seductive business, it seems). There have, over the years, been many examples discussed on these forums. Most of them got no further than an amateurish website but some have progressed a little bit further. Many posters will remember the two bites of the cherry taken by one young individual, both of which actually resulted in aircraft being painted up and then flown on a very few revenue earning flights (Alpha One and Varsity Express). To quote OTR from distant colleague at Essex Police - "we have already been made aware and are monitoring. At moment it seems to be just Lies and fantasist Hype. Its a Round Tuit thing- when we are actually told by some poor s-d who's actually been defrauded, we'll get round tuit". @jasonunsworth2 - member for 1,377 days, 70,019 tweets. That's 51 per day. @atmosphereairuk - member for 1,439 days, 120,259 tweets. That's 84 per day. So just these two streams have 135 tweets per day. Every day. How does he find the time to be CEO of an airline as well as a new dad?? Last edited by TwinAisle; 20th Mar 2019 at 21:14. Fly with them and they'll loss you cases. ....and that is where it is. Unless someone actually comes forward with a loss, say they put money down on one of the fundraising pages, there is very little the plod will do about it. As it stands, this is simply a Trading Standards matter for false advertising. I stumbled on this amazing thread yesterday. I shall be back regularly to keep up to date. .
Jason, could you find time during your busy social media days, to post your progress here? Just can't make it up really..... well actually, one person can! 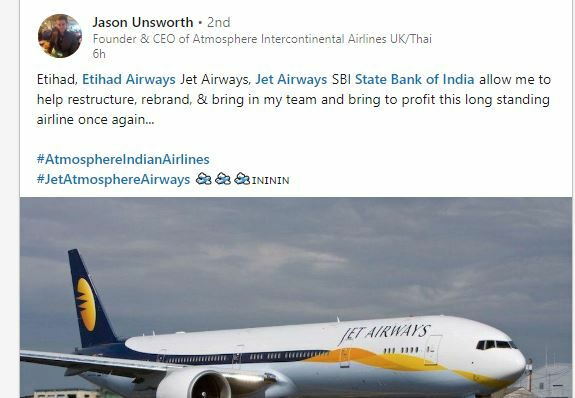 Saw he is back on LinkedIn, seems he is now getting `B737-800s and 787s lol thing is on LinkedIn seems some poor fools actually believe him!! !